While start-ups require entrepreneurs to exist in a state of high-energy hustle, established organizations require leaders who are good at building systems and achieving results through others. We’ve observed this general theme, regardless of the leadership style (e.g. pace-setting, visionary, democratic, command-and-control) that is being used. Treating an established organization like a start-up can do more harm than good! It may constrain an organization’s evolution by locking it into an earlier developmental stage. Conversely, handling a start-up (with its limited resources and unrefined approach) in the same way that you would treat an established organization, would make it difficult to get it off the ground. This article explores how social entrepreneurs and leaders should see and treat their organizations, depending on whether they are busy setting it up or whether it is already established. These insights are based on my personal observations over the past 20 years of consulting, combined with wisdom I’ve accumulated from my mentors, colleagues, books and other material. The picture below illustrates the typical timeline for launching a social enterprise or non-profit organization – for getting it properly established, and then working to strengthen it so that it can function as an independent learning system. Most social entrepreneurs who have set up organizations know how to hustle. They know how to juggle multiple projects, work late nights and weekends, and grab resources and opportunities wherever possible. These entrepreneurs are always “on”. They find time for themselves, family and friends in the spaces in between their work demands. They are agile and adaptable. Entrepreneurs need to spend a massive amount of energy to get their organizations off the ground – much like a jet charging down the runway and building up the speed so it can lift off successfully. Because their organizations are small and short of resources, these entrepreneurs need to be involved in every part of their organizations, micro-managing and putting out fires where necessary. They also need to be very skilled at engaging volunteers and staff (who may be working at below market rates) around the values and purpose of their organization. One can imagine these social entrepreneurs as existing at centre of a web with strands leading in all directions. As their organizations get more successful and expand, so more strands appear, and organizational complexity increases. Ultimately, the organization will achieve its maximum size and complexity according to the way it is being thought of, structured and run. Should organizational complexity increase beyond this threshold, then events (e.g. strategic or operational errors) tend to occur that result in the organization shrinking to within manageable parameters. This cycle can repeat itself, time and time again. Several entrepreneurs I have worked with, have chosen to intentionally contain the complexity of their organizations, and to limit it to a certain size (e.g. <10 people). This enables them to convert their start-up into something more established, while at the same time capping their organizational complexity (but not their impact) and creating something that they will enjoy running. Even though the entrepreneurship hustle has been developing a bad name of late, it still seems to work well in some start-ups. I just believe it has an expiry date; entrepreneurs and their teams cannot hustle and work 60+ hour weeks forever, and not expect negative consequences for their health and relationships, and the well-being their organizations. By the end of the first year, the social entrepreneur would most likely have secured some resources and help from people. Volunteers, friends, family and professional staff may have become involved in the organization. Workload is shared or delegated. All work is sort of done together, and everyone seems to be aware of what everyone else is doing. There is strong communication and coordination. I have often likened organizations in this stage of development to a family – sometimes a happy one, and other times a family filled with unhappiness and conflict. Gradually additional staff and resources are brought into the organization. Social entrepreneurs tend to start thinking about systems building, and formalizing and optimizing policies, procedures, tools and practices etc. Over the next five years, work becomes more specialized with specific roles being adopted. Increasingly all work is done by the broader team and not by the entrepreneur who set up the organization. Taking this one step further, I believe that all leaders should aspire to an organizational state where all strategic objectives are achieved through their team. There will be plenty of non-operational priorities that will require leaders’ attention. Off the top of my mind, these include: scanning the strategic horizon; developing strategic partnerships; positioning and building the organization’s brand in its sector; developing appropriate culture and capabilities; recruiting talent; communicating, coaching staff etc. The challenge is for leaders to increase their level of delegation and shift their focus from operational issues to strategic issues. While social entrepreneurs are always encouraged to see themselves as building systems and working “on their organizations” (as opposed to “in their organizations”), this change in perspective should be more pronounced in an established organization. To continue with our metaphor from earlier, once a plane has lifted off the runway, its course has been set, and the seat-belt light turned off, the pilots change their emphasis of focus and activity. They must focus on gaining altitude smoothly, monitoring the radar and communications, fine-tuning their mission plan, dealing with changing weather conditions and so on. How long does it take to properly establish an organization? In my experience, it takes approximately 5 years for a social entrepreneur to properly establish a non-profit organization or social enterprise – to develop an organization design and business model that works, and to develop a core team and secure some stable streams of income. I can’t think of any examples where this has been done quicker than this, but I can think of some examples where this has taken up to 8 years to achieve. I remember how it took me five years of consulting before I could reliably pay my debit orders each month, and not live in a perpetual state of financial anxiety. Believing that it is possible to set up an enterprise in a shorter time-frame is self-deception. This is something for organizations that support start-ups in the social sector to consider. A quick competition or hackathon or incubator or accelerator or training course can certainly help a non-profit organization or social enterprise to move forward, but support should be provided over a far longer time-frame to be truly effective. For example, I have several relationships with clients where I have supported them for over a decade. Leaders who continue to think and behave as if their organizations are start-ups, when in fact they have become established, are likely to constrain their organizations’ growth. I have often wondered about why some leaders do this. I have now come to believe that the root cause is an inability to see their organizations as a separate living system – something separate from themselves which they must carefully pilot now that it has got off the ground. Entrepreneurs who are unable to adopt this meta view will burn out, retire or hand their stunted organizations over to a successor. They are likely to feel trapped by their own organization and will come to resent it as much as they once loved it. Unfortunately, the organization may not ready be ready to sell or handover since it has never been seen as a complete or independent system. Rather a system has been created which is highly dependent on the founding social entrepreneur for every move and decision, hence the perpetual trap. This danger also exists for social entrepreneurs who have worked in and/or run established organizations. They would be equally mistaken to believe that their current mode of thinking and approach would work equally well in a start-up, when the nature and challenges faced by these two types of organizations are fundamentally different. Unless they have the luxury of time or have started with other resources, this approach is likely to be ineffective, and consequently, their organization would be unlikely to momentum to get off the ground. This article has posited that social entrepreneurs need to adopt a different approach to thinking about and running a start-up versus an established organization. 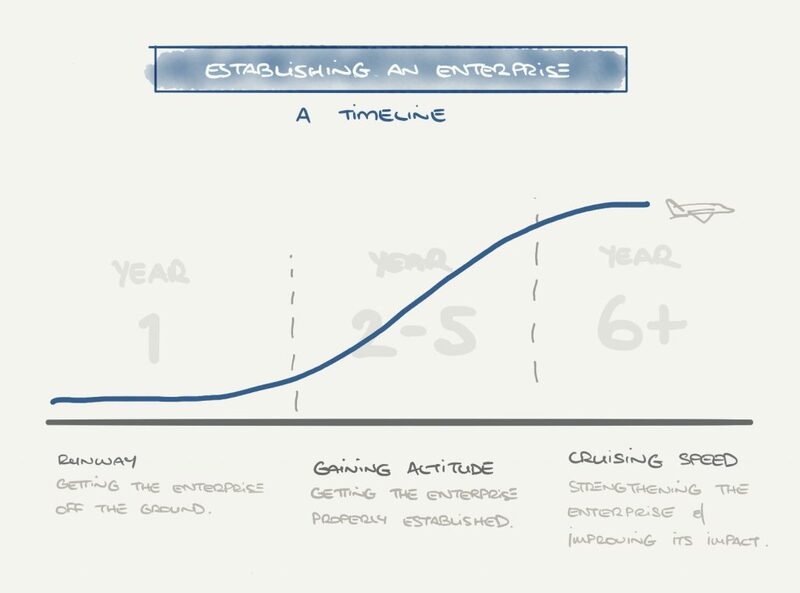 Much like a pilot of an airplane, entrepreneurs and leaders need to shift their approach as their organizations grow and gain altitude, and depending on the developmental stage their organizations are in. What might have worked well in one stage of growth, may cease to work in another. Some social entrepreneurs will find it difficult to make these shifts. It may be better for such entrepreneurs to rather think small, focus on depth of impact rather than breadth of impact, and intentionally contain the growth and complexity of their organizations. They can do this through setting boundaries on how big they want their organization to be in terms of staff and turnover. They can also design a business model (e.g. with high levels of automation and subcontracting) that enables them to focus their efforts on what they do best and most enjoy. They will have to be selective about the problems they want to tackle and the clients they want to work with. I intend to explore this in another article. My sense is that most of us have a general preference for the type of organization we wish to run. I’ve enjoyed running a consultancy practice for 20+ years and am very good at supporting social entrepreneurs and leaders. However, I have never thought of myself as an “entrepreneur” in the traditional sense. I’m aware of my leadership style, preference for change and novelty, desire to lead and nurture others, and to build organizational systems. This lends itself to supporting entrepreneurs and leading established organizations through change. The purpose of this article has been to encourage you to reflect on the stage of growth of your organization, and how you should think and behave towards it. Perhaps you need to make some shifts before its too late? I’m also curious whether your experiences have validated or found gaps in the viewpoint I’ve shared. Please let me know.